I know that it can be uncomfortable to be my friend especially when I share updates on children who are sick or dying. My deepest desire is that no parent would face a life-threatening diagnosis for his/her child and none of my friends would experience the pain and heartbreak of saying goodbye to one’s child. 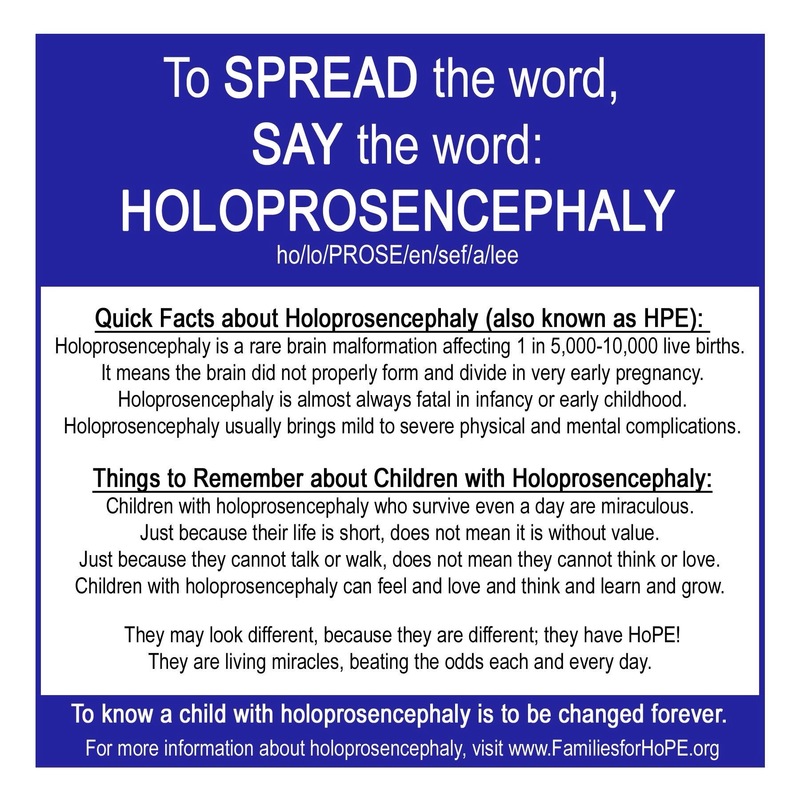 Can I tell you a little bit about Holoprosencephaly (HPE)? It is the most common brain malformation in a developing fetus. It occurs during days 17-21 of fetal development, and as a result, it often ends in early miscarriage. It is estimated that HPE occurs 1 in every 250 pregnancies, so if you experienced a miscarriage without an explanation of why, HPE could be the reason. Did you know that the likelihood of a fetus with HPE surviving to birth is only 3%? Let me say that again…3%! Can you imagine the determination and will it must take to overcome those odds? When one of our children with HPE passes away, it rocks our HPE community. We grieve for the parents, siblings and families, but I know we also celebrate the power and strength these children have had in the moments, hours, days and years that have made up the lifetimes they have known. I will never be as strong and courageous as these little ones have been in their lives, but their examples push me to step outside of my comfort zone, to give of myself to others in sharing my journey from HPE to HoPE. If you would like to know more about HPE or would like to help our cause, please visit http://www.FamiliesforHoPE.org. To learn more about my personal journey, visit http://www.SammyYammy.com. ← Strength . . .